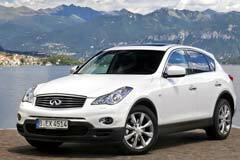 The Infiniti EX is an interesting vehicle option as it combines the look of an executive car with that of a crossover. It is a hatchback that is a mix of luxury and sport. Those who buy a used Infiniti EX tend to like the fact that it is so practical from a design point of view. The first generation of the Infiniti EX goes back to 2007 and various models were produced since then. These include the Infiniti EX Concept, the EX35, the EX37, the EX30D and the EX25. The transmission varies from 5-speed automatic with manual mode, to 7-speed automatic. Some comment on the fact that it has rather high running costs and that it requires quite a few revs to be able to deliver its full performance. The storage space is rather small as well. The newer versions come with push button ignition and a lot of add-on options. 2008 EX -- 2008 INFINITI EX35, Platinum Graphite with 98935 Miles available now! 2008 EX -- 2008 INFINITI EX35 Black Obsidian 4D Sport Utility with 123726 Miles!